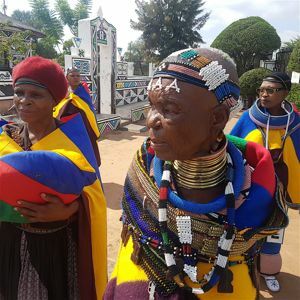 On the morning of 9 April 2018, a convoy of vehicles lined up at the homestead of 82 year old art icon Esther Mahlangu. 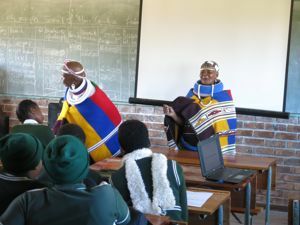 There was great excitement in the village of Mthambothini in rural Mpumalanga, the home and heritage she remains rooted in, despite her international fame. 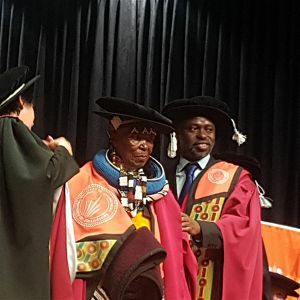 She was on her way to the University of Johannesburg where she would receive an honorary doctorate from the Faculty of Art, Design and Architecture (FADA). Dr Mahlangu does not speak English, nor did she ever learn to write. "When I was a child there were no schools in rural South Africa for black children", she recalls. 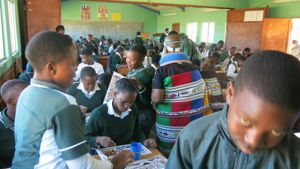 Now that the youngsters around her do attend school, she makes sure that the Ndebele heritage continues by teaching them to paint in the Ndebele style she inherited. 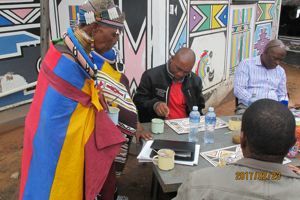 Above left: Esther Mahlangu guides teachers during an Africa meets Africa teacher training workshop which was funded by the National Heritage Council (NAC). For many years she has worked closely with the Africa meets Africa (AmA) project as we explore inherited local knowledge systems that date back to before the colonisation of southern Africa. 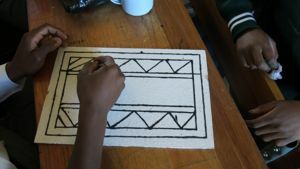 For AmA Esther Mahlangu created three paintings with which we teach both teachers and Grade 9 learners to paint in the Ndebele style, and then to do geometry with the sophisticated symmetries of her design. This familiar visual language of learning makes the abstract subject of mathematics accessible and brings true understanding. Learning departs from what is known and then succeeds. 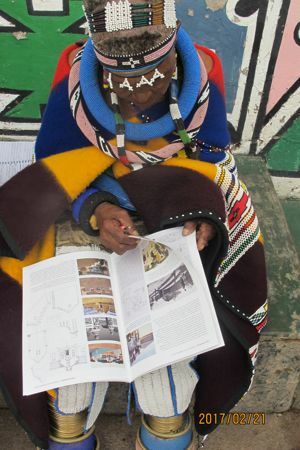 "In the context of current debates in South African institutions of higher learning on questions of decolonisation of the curriculum", commented Professor Federico Freschi, Dean of the UJ Faculty of Art, Design and Architecture, "Esther Mahlangu is a living example of how authentic African knowledge systems can be articulated meaningfully and sustainably. In her, we have an icon worthy of being looked up to by the next generation of creatives".